Science and nature are interesting for kids, and Smithsonian Readers capitalizes on this desire to learn more about these topics. Early Adventures covers safari animals, animal habitats, insects, vehicles, outer space, and reptiles. Beautiful photos fill each page, bringing the text alive and making it more engaging. Each section closes with a multiple choice quiz to determine reading comprehension. The Smithsonian Readers series is designed for early, developing, engaged and fluent readers. In this level 1 book, kids will read basic factual texts with familiar content and simple repeated sentence structures. Smithsonian Readers: Early Adventures Level 1 is sure to generate some curiosity and enthusiasm in the home and classroom. I highly recommend it. Kids have a natural curiosity about history and the natural world around them. While picking up an encyclopedia might be the best way to look up information about a subject that interests them, reading one of the 275 cards in this box set might also do the trick. Although there is only a snippet of facts, enough is presented on each topic to give kids a chance to research in more depth. Subjects in this box include: Outer Space, Science, Inner Space, Weather, Earth in Motion, Biomes and Ecosystems, Human Body, Animal Relationships, All About Plants, Insects, Endangered Animals, Lay of the Land, Natural Wonders of the World, Man-made Wonders of the World, Ancient Times, U.S. Presidents, History Makers, and American History. Although the title Everything You Need to Know might be a bit overly ambitious, there is a wealth of interesting material here that can generate hours of research and exploration. Teachers might also be able to use these cards as idea starters for projects and papers. Mind Muddlers: What you see is not what you get! Certain patterns and designs can play havoc with our senses. When looking at these optical illusions, we think we see something, but it’s only our eyes playing tricks on us. In Mind Muddlers, kids are introduced to some of these interesting designs. Impossible pictures, patterns that seem to be moving, and flat designs that appear to be in three dimensions are all featured in this unique book. Kids will enjoy seeing these mind-muddling pictures, and they are also encouraged to design their own optical illusions. Kids have always been fascinated with animals, and many kids would love to have a job spending time with them every day. But what kind of education will they need, and what kind of jobs might be available? Zoology for Kids addresses these and many other questions. In part one, zoology for beginners, animal form and function is covered, as well as behaviors and environments. Part two addresses the various jobs a zoologist might have, such as zookeepers, aquarists, veterinarians, wildlife researchers, and conservation warriors. Throughout the book, kids are encouraged to participate in activities designed to simulate the discussion topic. Kids who want to work with animals might feel limited to being a domestic animal veterinarian, shelter volunteer, or pet store employee, but there are lots of opportunities for kids who want to work with wild animals. Exotic zoo animals also need to see the veterinarian to maintain good health. And if kids want to travel to foreign locations, they might have a calling for field research. Zoology for Kids presents a very detailed and comprehensive guide for kids to discover a career in zoology. Our brains are the computers in our heads that allow us to think, move, and keep our bodies functioning properly. But what exactly is a brain made up of, and how does it work? That’s What You Think! shows us many facets of the brain in short, one-page or less snippets, each focusing on a single concept. What does a brain feel like? How does the brain send commands around the body? How do we store knowledge? Does the brain switch itself off at night? These and many more questions are answered in this book. Clever photos of kids in various positions imitating brain function are interspersed between the narrative sections. This is not a true science book, although it does touch on scientific concepts. There is no bibliography or cited sources of any kind. As a result, I felt unsure of some of the statements it made, such as, “Scientists don’t exactly know if [a concussion] causes any real damage to the brain.” With all the discussions lately about sports safety and traumatic brain injury, this doesn’t seem to make sense. The book also attributes the creation of animals and humans to “nature” rather than God, which Christians will find objectionable. If approached casually, this book is an easy read and interesting overview of how the brain works. But for serious study, it would be wise to consult a true science book. A is for Astronaut, B is for Black Hole, and C is for Comet. Readers will discover this is no ordinary ABC board book. As children recite their alphabet along with the American Museum of Natural History, they’ll also be studying astronomy. Each letter corresponds to space phenomena or equipment used in exploring the universe. Stunning photos accompany the narrative text. ABC books can be pretty boring and repetitive for both kids and adults. 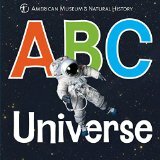 While ABC Universe is not really suited for very young children, it will help foster curiosity about the universe as they get older. And parents will find it a much more enjoyable read than A is for apple.